The transcription factor T is essential for mesoderm formation and axial development during embryogenesis. Embryonic genotype for a single-nucleotide polymorphism in intron 7 of T (TIVS7 T/C) has been associated with the risk of spina bifida in some but not all studies. We developed a novel genotyping assay for the TIVS7 polymorphism using heteroduplex generator methology. This assay was used to genotype spina bifida case—parent trios and the resulting data were analyzed using the transmission disequilibrium test and log-linear analyses. 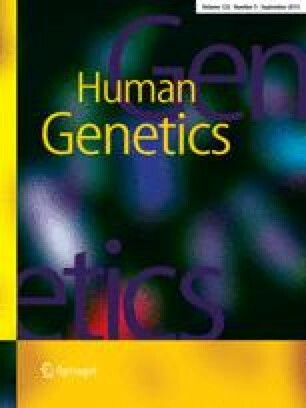 Analyses of these data demonstrated that heterozygous parents transmit the TIVS7-C allele to their offspring with spina bifida significantly more frequently than expected under the assumption of Mendelian inheritance (63 vs 50%, P=0.02). Moreover, these analyses suggest that the TIVS7-C allele acts in a dominant fashion, such that individuals carrying one or more copies of this allele have a 1.6-fold increased risk of spina bifida compared with individuals with zero copies. In silico analysis of the sequence surrounding this polymorphism revealed a potential target site for olfactory neuron-specific factor-1, a transcription factor expressed in the neural tube during development, spanning the polymorphic site. Several other putative, developmentally important and/or environmentally responsive transcription factor-binding sites were also identified close to the TIVS7 polymorphism. The TIVS7 polymorphism or a variant that is in linkage disequilibrium with the TIVS7 polymorphism may, therefore, play a role in T gene expression and influence the risk of spina bifida. This study was supported by grants from the National Institutes of Health (HD39195; HD39081), the Ethel Brown Foerderer Fund for Excellence and the General Clinical Research Center (M01-RR00240) of The Children’s Hospital of Philadelphia. The authors are grateful to their colleagues in The Spina Bifida Program (Dr. P. Pasquariello and J. Melchionni) and The Center for Fetal Diagnosis and Therapy (Dr. N.S. Adzick, Dr. M.P. Johnson, Dr. R.D. Wilson, L. Howell, S. Miesnik, M. Oxman and S. Kasperski) at The Children’s Hospital of Philadelphia, and in the Spinal Dysfunction Clinic at The A.I. duPont Hospital for Children (Dr. M. McManus and R. Gleeson), and to all of the families that have enrolled in this study.